Use the flight price comparison tool on the left to identify and reserve the cheapest airfare. Use SouthAfrica.TO travel vouchers to discount the cost of your flight. If you've got no travel vouchers, then start earning them with your flight to Pakistan - simply send us an email telling us of your flight experience and we will send you a travel voucher. 5 Nov 2013 : Emirates commences 4 weekly flights to Sialkot in an Airbus A330-200; creating 1-stops from Cape Town, Johannesburg & Durban via Dubai. Fly 1-stop from Johannesburg to Islamabad (ISB) with Etihad (via Abu Dhabi), Emirates (via Dubai) or Qatar Airways (via Doha). Fly 1-stop from Johannesburg to Karachi (KHI) with Turkish Airlines (via Istanbul), Emirates (via Dubai), Qatar Airways (via Doha) or Thai Airways (via Bangkok). Fly 1-stop from Johannesburg to Lahore (LHE) with Emirates (via Dubai) or Qatar Airways (via Doha). Fly 1-stop from Johannesburg to Peshawar (PEW) with Etihad (via Abu Dhabi), Emirates (via Dubai) or Qatar Airways (via Doha). 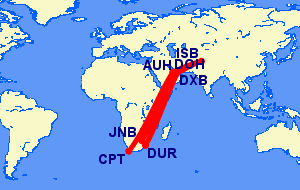 Fly 1-stop from Cape Town to Islamabad (ISB) with Emirates (via Dubai) or Qatar Airways (via Doha). Fly 1-stop from Cape Town to Karachi (KHI) with Turkish Airlines (via Istanbul), Emirates (via Dubai) or Qatar Airways (via Doha). Fly 1-stop from Cape Town to Lahore (LHE) with Emirates (via Dubai) or Qatar Airways (via Doha). Fly 1-stop from Cape Town to Peshawar (PEW) with Emirates (via Dubai) or Qatar Airways (via Doha). Fly 1-stop from Durban to Islamabad (ISB) with Emirates (via Dubai). Fly 1-stop from Durban to Karachi (KHI) with Emirates (via Dubai). Fly 1-stop from Durban to Lahore (LHE) with Emirates (via Dubai). Fly 1-stop from Durban to Peshawar (PEW) with Emirates (via Dubai). Invitation letter from Pakistani company that includes purpose of travel and address/contact details (business visitors only). The signee must submit a signed copy of their ID, passport, or residence permit. Letter from South African company outlining business to be conducted in Pakistan. A list of companies to be visited must be included. For the latest up to date requirements, contact theHigh Commission of Pakistan at 012-3624072/3 or pareppretoria1@telkomsa.net. Their physical address in South Africa is 312 Brooks Street, Menlopark, Pretoria. The currency used in Pakistan is the Rupee. Urdu and English are the national languages, however the use of English is limited to government and business. The Karakoram Highway takes you on a winding path through green hills from Islamabad to western China. Adventure lovers will be drawn to this route, which used to be part of the Silk Road. Tall peaks and glaciers crowd the highway offering endless trekking opportunities that are just as challenging as they are awe-inspiring. Lahore is a dizzying mix of ancient history, vibrant culture, and art. Mughal monuments sit cheek-to-cheek with British Raj architecture. A trip into the Old City and the city’s tranquil gardens is a must. Spiritual nourishment is also guaranteed in Lahore—it’s well-known for its powerful Islamic devotional singing and mysticism. Quetta’s isolation (it’s surrounded by mountains and desert) makes it a unique stop in Pakistan. Indeed, it bears more resemblance to neighboring Afghanistan than the rest of the country and its inhabitants are a fascinating mix of ethnicities. It also boasts cooler temperates. Be sure to stop into the famous bazaars full of colourful handicrafts such as embroidered coats, Afghan rugs, fur coats, and sandals. The turquoise waters of Hanna Lake nearby are also a popular spot for vacationers. Karachi offers a chance to see the cosmopolitan side of Pakistan. The city is an intoxicating and diverse mix of cultures and religions. Christian, Zoroastrianism, and Hindu communities sit side-by-side with ethnic Sindhis, Punjabis, and Pashtuns. The mix of architecture is equally stunning and when you need to relax, numerous beaches are nearby. Civil violence is still a problem, so do your research before you travel. The climate varies wildly in Pakistan, however October to February is generally cool, March to June is hot, and July to September is the wet/monsoon season. Trekking is best done between late April and late October (mid-June and mid-September is the most ideal time). Daytime and nighttime temperatures can vary greatly at all times of the year.